Chuck Schumer helped coordinate the Democrats’ strategy, but Judiciary Chairman Chuck Grassley refused to hold a vote on adjournment. 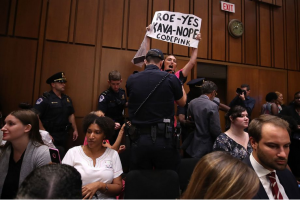 Democrats sought to take control of Brett Kavanaugh’s Supreme Court confirmation hearing Tuesday, mounting a failed bid to delay President Donald Trump’s nominee and interrupting Republicans dozens of times as multiple activists on the left disrupted the proceedings. The volley of Democratic interjections began after Senate Judiciary Chairman Chuck Grassley (R-Iowa) attempted to open the high-stakes four-day hearing. Senate Minority Leader Chuck Schumer (D-N.Y.) helped coordinate that strategy despite not serving on the Judiciary panel, convening a call with the committee’s minority members over the weekend, according to a source familiar with the planning.